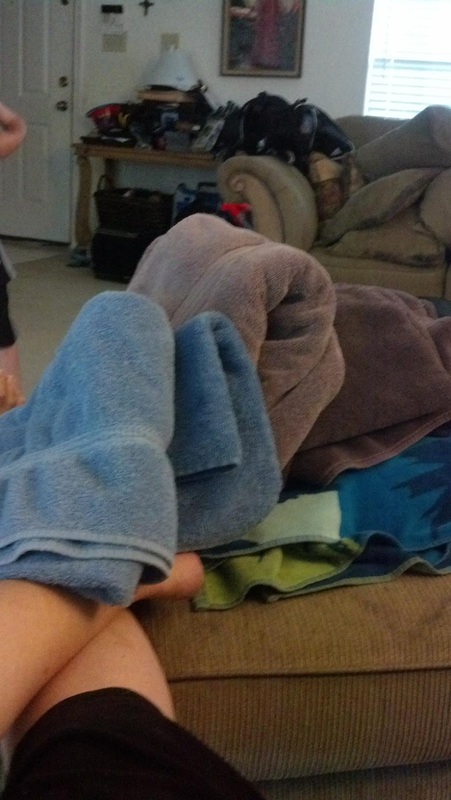 No nice, flat, pile of towels for me(yes, that is my foot the pile is covering)! 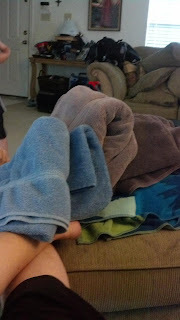 I've just been refolding all of the towels before I put them away. At some point, when he is older, I'll talk to him about how our routines are different from others, and we'll adjust, but there's not much of a point having a battle over it now, right? 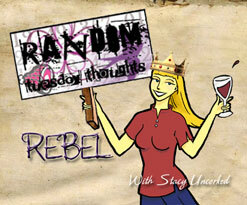 Have you ever felt like you had thousands of things to do, but not the slightest interest in doing any of them? I think that is the essence of summer. Summer-itis, as it were. I've got all these grand plans, piles of work to go through, and there it still sits. I just don't feel like doing any of it. Instead, I've been playing Plants vs. Zombies with Zane, reading, and some days not even getting out of my jammies. Lazy! Oh well. It's summer. I'm too lazy to feel guilty about being lazy. 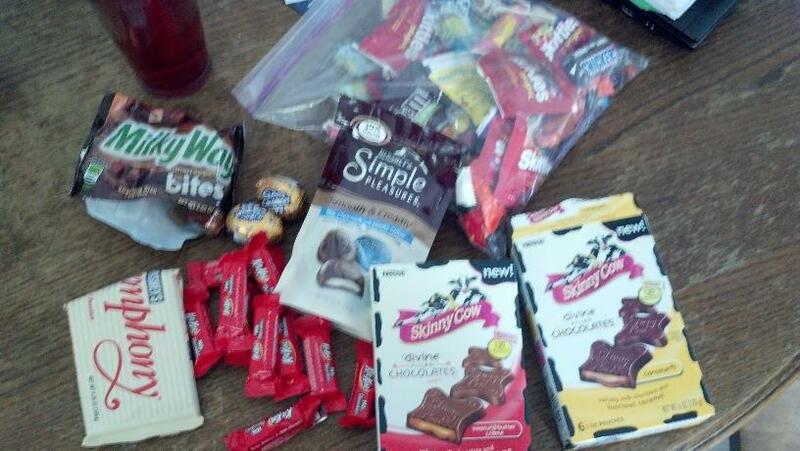 My friend Andrea, over at Maybe It's Just Me, blogged about her candy stash yesterday. I thought about it later, and opened a few cabinets, and well...I guess I have a candy stash too! I just randomly buy candy if I see something interesting out there. I have even tried that Skinny Cow chocolate, which wasn't that bad. I also discovered that Zane has a stash of candy from the many parties his class had during the school year, just in case he needs a quick chocolate break. It's nice to see that I am raising him right. When you have a five year old and a puppy, you may as well have a revolving door into the back yard. 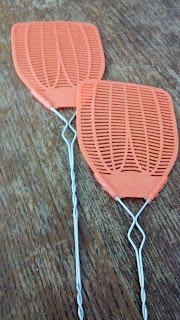 Summer time means that there are lots and lots of flies flitting about, doing fly-type things and annoying the populace. Sometimes these flies make their way into our kitchen. Since the back yard door is in the kitchen, I'm not comfortable spraying pesticides in there, where food is served. 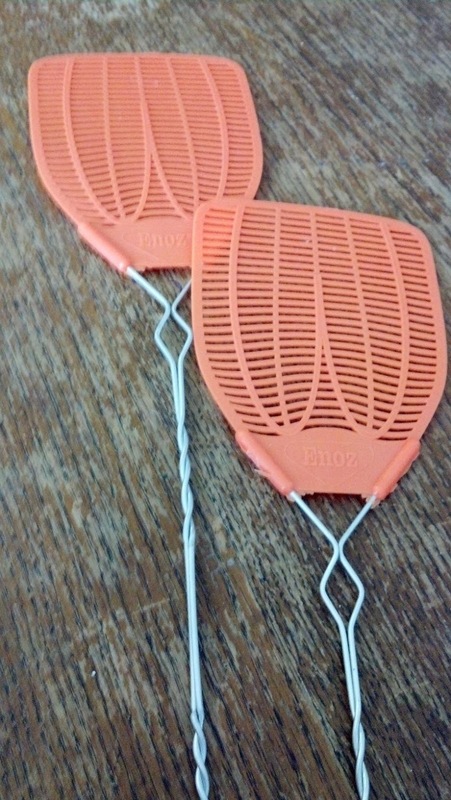 So we've resorted to the old-fashioned method of removing flies and other pests--the fly-swatter. That's a non-techie way of dealing with a problem, I know, but my motto is "whatever works." Since this is a military town, we like to do up Independence Day right. We've had enough rain that we can have fireworks without setting fire to the countryside. I full expect that there will be little sleep on the fourth, especially if our dog does not like fireworks. When Sandy the Wonder Dog was alive, we had to put her in the bathroom with the hot tub running so the sound would drown out the pops and booms. She just could not handle all of the noise. Maisy has done okay with thunderstorms, but she has not had to deal with fireworks yet. I won't feel comfortable leaving her at home alone if she is going to go nuts here! Cats are so much easier to deal with--Zena and Pounce don't even wake up! Go visit Stacy! She is awesome! Also, stay safe this week, especially around fireworks--they're pretty from a distance, but they can be dangerous. All I can say is your household sounds similar to mine! The five year old, the chores and just replace dog with cats! We just added the pup. Two years ago, we had 4 cats, but two of them have gone to kitty heaven. Whoah lady, that is some high quality chocolate there! Where are the gummy bears? Where is the licorice? Those items don't hang around!